It’s a bit ironic that this painting by the American artist most well-known for creating the fadeaway girl, where the background and clothing colors match, would, as of May 5, 2010, be the painting which garnered the highest auction price of any of his works. 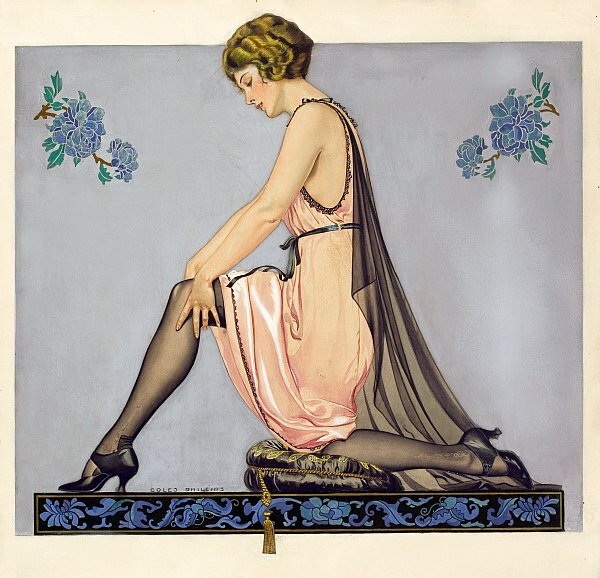 Coles Phillips (1880-1927) left behind a wonderful group of watercolors, magazine covers and advertising images of fashionable, 1920’s women and this is one of the finest examples of his work. This watercolor was used for an advertisement for the Holeproof Hosiery Company. The model is shown smoothing out her lovely black hosiery while kneeling on a satin pillow. Her peachy, pink dress and shear cape are lovely but do not detract from the lady’s lovely legs and the stockings that she is wearing. To see more of this artist’s advertising images and magazine covers, please visit our Coles Phillips biography.